John Wyble is the CEO of WinPower Strategies, a Democratic campaign consulting firm. He will write an occasional column for the Wire, called “From the Left,” throughout the year. 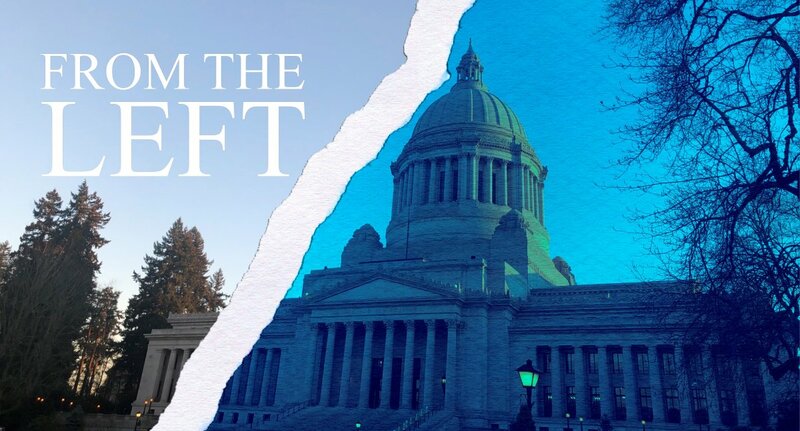 As the presidential campaign of 2020 starts heating up, our state elected officials are gaining a newfound prominence in our nation’s political conversations. Of course, this new attention starts with Gov. Jay Inslee. Gov. Inslee has all but announced that he will run for president in 2020. He will bring his passion and dedication to addressing climate change to the presidential debate. Inslee has hit the ground running already with new, strong Democratic majorities in the House and Senate in Washington State. 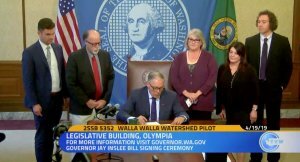 Out of the gate, Inslee has proposed a 100 percent clean energy plan that includes constructing ultra-efficient buildings, establishing a clean fuel standard, electrifying the state’s transportation system, and phasing down super-pollutants in certain products. 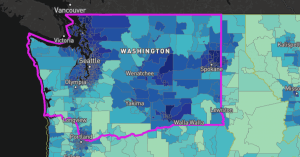 Combined, the policies would reduce greenhouse gas emissions in Washington state to 25 percent below 1990 levels by 2035. Inslee smartly spent the last year as the chair of the Democratic Governor’s Association, crisscrossing the country in support of Democratic governors while raising his profile on the national stage. He will bring his track record in Congress and as a two-term Governor, and his leadership on climate change to a crowded and heated Democratic primary. 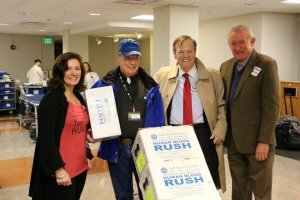 But, Inslee isn’t the only Washingtonian making waves. With a new Democratic majority in Congress, Congressman Adam Smith will begin the year as Chair of the powerful House Armed Services Committee. He has ambitious goals to make our military more efficient, more transparent, and more inclusive. He has already provided a strong counterpoint to Trump’s call to bring in military troops to the border, calling it a “politically motivated stunt.” Read more in the Stranger here. Rep. Pramila Jayapal continues to break ground as the first Indian-American woman in Congress, taking bold, progressive stances in defiance of President Trump. She is a consistent voice of resistance on national talk shows and one of the leading champions in Congress for the “Medicare For All” proposal. After facing a grueling election campaign in Washington’s Eighth Congressional District, Dr. Kim Schrier will be the only female doctor and only pediatrician in Congress. She has promised to bring a more science- and data-driven decision-making process to the nation’s capitol. Congressman Denny Heck has a front row seat on the Mueller investigation and allegations of Russian collusion in the 2016 election with his seat on the House Permanent Select Committee on Intelligence. The committee oversees the nation’s intelligence agencies, including components of the Departments of Defense, Homeland Security, Justice, State, and Energy. Heck is frequent voice in opposition to the president and could play a critical role when the Mueller Report is released. 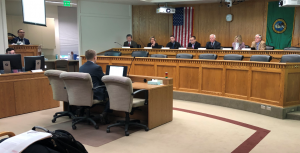 Representing Tacoma and the Peninsula, Rep. Derek Kilmer has been charged with the task of modernizing the byzantine and arcane procedures of Congress with a role on the “Select Committee To Modernize Congress”. Kilmer has already garnered a seat on the House Appropriations Committee, when Democrats were in the minority. He is known as an incredibly hard worker, and his tenacity should prove valuable for the 6th District and Washington as Democrats regain power. Washington State has been on the leading edge of a host of issues in the last few years. Our state led the nation in pushing $15 minimum wage increases in Sea-Tac and Seattle. We were one of the first states to pass legalization of marijuana. We are leaders on gun safety as the first state to close the background check loophole, enact extreme risk protection orders, raise the minimum age to purchase a semi-automatic weapon, and ban bump stocks. On the other side, Seattle has been ground zero for a housing affordability and homelessness crisis. We are also experiencing first-hand the effects of climate change with smoky skies and wildfires over the last few summers. Given all this, it makes sense that our groundbreaking politics start to get noticed across the country. It also makes sense that our elected officials bring their experienced voices on climate change, national security, Russian collusion, immigration, workers’ issues and the panoply of challenges facing the nation. Many people in Washington State refer to the nation’s capital as “the other Washington.” This may be the year when that distinction starts to blur.